How about a beach holiday in Menorca this year? Mallorca’s little sister may be quieter and more low key, but Menorca has plenty of charms all of its own. A holiday in the Balearic Islands in the heart of the Mediterranean Sea is the perfect way to rest and relax. From the moment you arrive on the island and take a taxi from Menorca airport to your destination, you will find yourself letting go, clearing away the stress of normal daily life. While Menorca (or Minorca as it is also known) may not have the exciting vibe of neighbouring Mallorca or the party island of Ibiza, the island is justifiably famous for its endless sandy beaches and cosy bays with warm, clean turquoise waters. Attractive pine tree forests line the coast, offering shady strolls after a day in the sun. There is an endless selection of gorgeous clean and sandy beaches to choose from all around the island's coastline, but the following stand out and are perfect for family holidays. Ideal for families with children, Arenal Den Castell offers fine, white sand, nestled in a protective bay with warm and shallow water. Enjoy a picnic in the tree-shaded area or let the kids have fun in the play area. Services include free parking, a beach bar, showers and toilets, while the fun includes pedaloes and kayaks available for hire. For those who like to get under the water, snorkeling is excellent here. This white sandy beach is nestled in a long inlet, making the water both shallow and warm. There are several beach restaurants and shops in the area and wonderful views across to neighbouring Mallorca and its mountains. There is a diving school available for those who enjoy sea life and a small children’s water play area next to the beach. Cala en Blanes in also set in a long inlet, with warm and shallow water, with a sandy beach, shaded close by with palm trees. This area offers a picnicking spot and BBQ facilities along with public toilets. There are several beach bar restaurants along the coastline as well as swimming and sunbathing platforms, separate from the beach. Cala en Bosch is one of Menorca’s few purpose-built holiday resorts and can get crowded during the summer season. This white sandy beach is also set in a protective bay, making it ideal for children. Services include plenty of beach bars and restaurants. 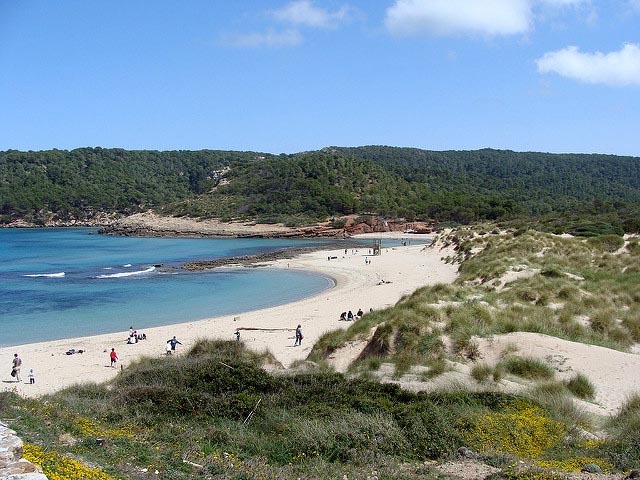 The beach is a short, 5 minute walk away from a quieter and smaller beach at Son Xoriguer. 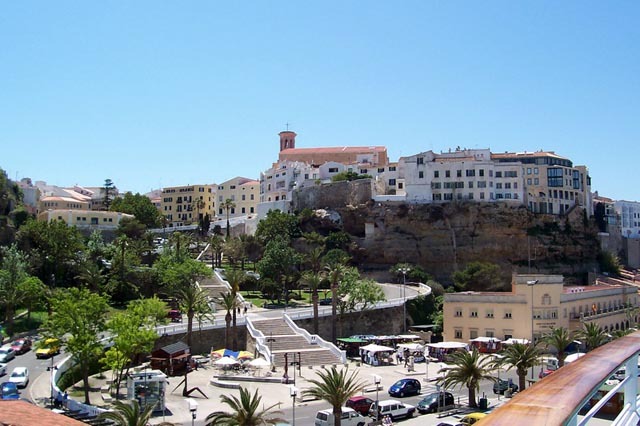 For a break from the beach, visit the island’s capital, Mahón (also known as Maó in the Catalan language). Located on the island’s eastern coast, Mahón is situated on a bluff overlooking one of the largest natural harbours in the world. A tour of the city will reveal beautiful Georgian mansions, along with a church dating back to the 13th century. In the restaurants of the city, enjoy the traditional Mahón cheese along with other delicious island local cuisine. Of interest to note, it is believed that the city was the origin and birthplace of mayonnaise, along with its name.